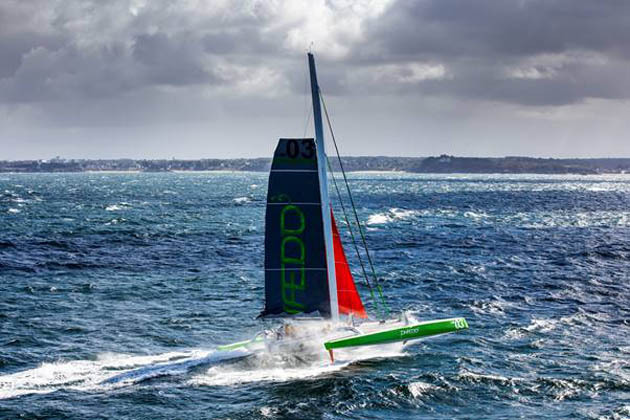 Team Phaedo has announced their intention of entering their MOD 70, Phaedo 3 in the 2016 Volvo Round Ireland Yacht Race. The boat is currently in Barbados for the Mount Gay Round Barbados Race. Lloyd Thornburg has been campaigning his MOD 70 Phaedo 3 for a year now. He has had an incredibly successful run of world records and regatta wins. This year, after a few events in the Caribbean, he will be heading over to Europe again. Here he will be taking part in the Volvo Round Ireland Race 2016 and is really looking forward to the challenges this race will bring for the MOD70 and his crew. Back in November, Ned Collier-Wakefield confirmed that Team Concise would be entering their 3 boats in the race, including Concise 10, their MOD 70. Concise 10 and Phaedo3 compete regularly on the off-shore sailing circuit and Volvo Round Ireland will now be added to their list! Yesterday Monday 18th January saw the opening of on-line entries to the 2016 Volvo Round Ireland and ISORA veteran Kuba Szymanski was first to register. Kuba will race his new boat Polished Manx 2 – First 40.7. Boats from France, UK and Ireland have been registering thus far with anticipation building that Volvo Round Ireland 2016 will be an epic race in the series.